The Toronto Education Workers will be at the Toronto National Home Show from March 14th to the 23rd to greet members of the community with free activities, games, an interactive bus, and a chance to meet new TEW mascots Juanita, Barry and Charlene. 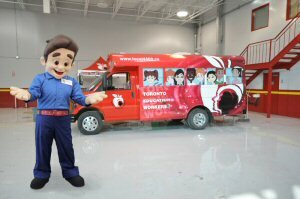 The new bus and mascots are part of a campaign TEW has kick started to further educate the community about their members and the jobs they do every day to keep Toronto schools running smoothly. Each of the new mascots showcase a job represented by TEW. Barry, the Caretaker, ensures schools are secure, safe and clean; Juanita, the International Language Instructor, helps improve student comprehension of various languages and cultures; and Charlene, the Office Administrator, acts as a resource for parents, teachers and students while ensuring the maintenance of all school records and protocols. TEW President John Weatherup discussed the importance of educating the community about these vital roles. "It's important for the community to see the hard effort our members put in to provide a safe and fun learning environment for our children," said Weatherup. "The support jobs in schools are definitely integral to the Toronto school system and it's important these positions are recognized. Our members represent more than 400 support positions within the TDSB. Without these dedicated workers, schools would not be able to run properly - if at all." The Toronto National Home Show will take place at the Direct Energy Centre. The TEW booth and Fun Bus will be located near the idea stage and food court with hours of operation from 10 am - 9 pm (Sundays from 9 am - 5 pm). Community members are invited to come out for lots of free activities, family photos, and a chance to meet the mascots. The TEW Fun Bus and mascots will be travelling to other local locations throughout the year. Weatherup says it's all a part of TEW's goal to connect with more of the community. "We want to connect with the community and provide children and families with a fun, memorable outing," said Weatherup. Visit the Toronto Education Workers on Twitter or on Facebook to see where the Fun Bus will be next! To view the photo associated with this press release, please visit the following link: http://www.marketwire.com/library/20140313-933239.jpg. To view the video associated with this press release, please visit the following link: http://www.youtube.com/watch?v=aaQ5YGSFRWA. Barry, the Caretaker, poses beside the TEW Fun Bus. Community members are invited to come out for lots of free activities, family photos, and a chance to meet the mascots. Without Caretakers in our schools, who would ensure your child's learning environment is secure, safe and clean?